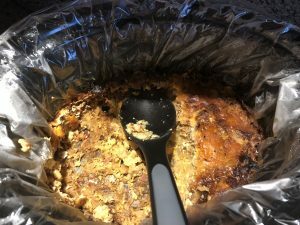 Crockpot Breakfast Bake- Gluten Free | Awkward; Yet Healthy. 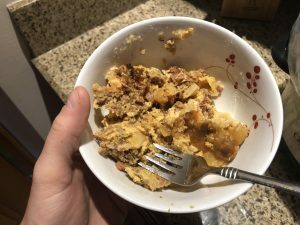 This crockpot breakfast bake is one of my all-time FAVORITE recipes. It is phenomenal for when you have company and want a delicious breakfast at home, or if you know you’re going to be under the weather (ahem hungover) the next day. I do recommend a liner for this to simply clean up too, just to keep with the overall simplicity theme. Warning: This is NOT dairy Free, low fat, OR low carb. This is straight up comfort food. It is, as always, Gluten Free though. It’s not pretty…but it’s delicious! Chop up all the meats and the onion. Mix together and set aside. Put a layer of the frozen hashbrowns on the bottom of the crockpot. Use about 1/3 of the bag. Add a layer of meats and onion, using about 1/3. Add a layer of cheese, again about 1/3. Repeat steps 2-4 until you have 2 layers that go: potato, meat, cheese. The last layer that is just potatoes and meat. The final layer of cheese will be added in step 7. Crack all 12 eggs into a bowl, season with salt and pepper, and whisk. Once fully mixed, pour the eggs over the top of the layers. Cook on low for 8 hours. Typically I put it in at 11 pm or midnight and set the timer so it automatically switches to keep warm after 8 hours. Suffer all night smelling the delicious. Use turkey bacon or sausage, or limit the meats to only 1. Consider adding vegetables such as bell peppers, broccoli, and radishes for one layer instead of the hashbrowns. Use egg whites in lieu of whole eggs. Skip the Cheese, or limit it to only one layer. Take Juice Plus so you don’t feel too guilty for indulging. Have a shake for lunch to even things out. The key with this recipe is to have enough eggs to penetrate all the layers so that you get that lovely pie style bake. Feel free to mess around with it until you find a version that meets your food and taste goals!